Flagship powerful Portable PA System with industry leading list of features. Includes internal Lithium-ion rechargeable batteries, wireless handheld microphone, wireless receiver, remote controlled Bluetooth media player with USB, external amplified output to optional extension speaker, protective case and more! The Promic range of Portable Public Address systems are the ultimate on-the-go take anywhere wireless solutions. The flagship Promic PA-300W is an industry leader in powerful Portable PA Systems and has an impressive list of features wrapped up in a sturdy, lightweight injection moulded ABS cabinet that will withstand everyday wear and tear. The system is supplied with a 24V 8A rechargeable Lithium-ion battery to provide several hours continuous use on battery, or continual use when plugged into mains power. The high power 300W class D amplifier features a two way speaker system with 12" woofer and a high frequency horn ensuring excellent sound quality for both music and speech reproduction. Package includes wireless handheld microphone and wireless receiver included ready for grab-and-go wireless performance. The PA-300W also has an active (powered) line out to an unpowered extension speaker - useful for larger events as the whole 2 speaker setup can take its power from the PA-300W internal 24V battery. With retractable handle and wheels making transportation a breeze, this feature packed system is truly portable, allowing a wide range of use in schools, sporting venues, clubs or anyone wishing to communicate wirelessly to a large audience. A FREE nylon protective cover (normally $99) with huge accessory pockets allows for safe transportation and keeps all the cords, microphones, spare batteries etc together for easy storage. A lightweight speaker stand is available as an option to elevate the speaker to increase coverage and a 35mm speaker stand bracket is built-in on the underside the system. This powerful PA system features a high performance internal class D amplifier that delivers 300W (max) of clear crisp audio through a 12" woofer speaker and 1" horn tweeter. The amplifier and speaker drivers are perfectly matched for high efficiency and low power consumption. Featuring a large 12" woofer speaker and 1" horn tweeter, the amplifier and speaker drivers are perfectly matched for high efficiency and low power consumption. Featuring a lightweight and maintenance free Lithium-ion rechargeable internal battery. Lithium-ion batteries are up to 20% lighter than standard SLA batteries and can be stored for long periods of time without the need for charging.. The Promic PA-300W Portable PA System use the latest in UHF PLL synthesized radio microphone technology. Each system is installed with a wireless receiver and is shipped with a wireless handheld microphone as standard. An expansion slot is available for the installation of an optional second wireless receiver to be used with a second handheld wireless microphone, or wireless body pack transmitter with headset or lapel microphone. The ‘luggage’ type trolley wheels and extendable handle ensures easy manoeuvrability. Set up in just seconds for instantaneous use. Supplied with a FREE nylon cover with accessory pockets (normally $99). Protective cover can remain on the speaker whilst in use due to clever zipper system on front and rear. As the unit is battery operated you can use the PA-300W anywhere! Quick and easy wireless audio streaming from your Bluetooth device to your PA-300W speaker. Play saved playlists or stream direct from your favourite online streaming service such as Spotify, Pandora etc. This model features the added bonus of MP3 playback from a USB slot. Insert a USB flash drive loaded with hours of your favourite MP3's. Fit more than 20 x more content on a USB than a CD! USB for flash drives up to 16GB. Enjoy the high speed and low cost of playing audio by inserting a SD card into the built-in SD card slot. Great for dance classes, parties, morning national anthem at school or anywhere music is required. The PA-300W has 2 x combined 6.35mm/XLR microphone inputs for use with a corded microphones. 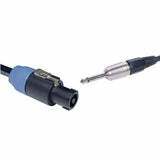 There is also RCA and a 3.5mm line in for use with external audio devices (iPod, laptop, smartphone etc). Increase your coverage with the option to have a second extension speaker connected to the PA-300W. Simply connect the passive speaker to the EXT OUT jack of the main system to double the coverage. 1 x Nylon Protective Case with Storage Pockets. We recently ran our annual big swim on the beach. We used the Promic PA-300W to marshal over 500 swimmers and many more spectators at the start/finish line. The PA-300W worked perfectly and the ability to use it all morning from battery power is amazing. All the other surf clubs now want there own! Amazingly powerful with clear, crisp sound. Display: LCD Display Including Artist, Song Name, Modes etc.